The Vernon Community Arts Centre (VCAC), operated by the Arts Council of the North Okanagan (ACNO), is a community based facility providing a variety of CLASSES and workshops for beginner, intermediate and professional artists of all ages. The VCAC also provides studio DROP IN SESSIONS, allowing for individuals to interact and collaborate. Our JOINING HANDS program provides adults living with a disability the opportunity to participate in artistic activities. We also host many EVENTS throughout the year. The VCAC’s CENTRE GALLERY is open to the public and showcases the work of ACNO members. Come visit us today to see all we have to offer! Located in Polson Park, Vernon, BC. To become a member of the ACNO, visit their website. The latest issue of the ArtScene newsletter is hot off the press! CLICK HERE to give it a read and learn about all of the exciting arts and culture events happening in the Okanagan throughout March and April 2019. Spring 2019 art classes are open for registration! Be sure to check out our wide selection of adult and youth classes in clay, painting, drawing, glass, music, print making, digital animation, fabric, and more. See the whole list here – there’s something for everyone! 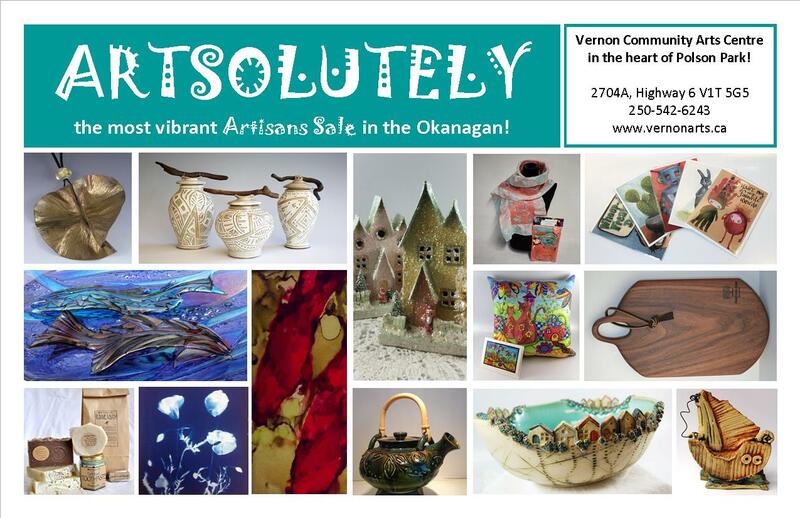 Artsolutely is the most vibrant artisans sale in the Okanagan, with 25 of the North Okanagan’s Finest Artisans. Open 7 days a week from December 1 to 24th! Artsolutely is also an annual fundraiser for the Arts Council of the North Okanagan. Shop locally this Christmas and support your local artists and art organizations at the Vernon Community Arts Centre, located in the heart of Polson Park! On Episode 9 of Artisans’ Alley, host Patricia Doyle heads to Bob Kingsmill’s Pottery Studio in Coldstream. Nature’s Fare is now offering a program to non-profit organizations in the community. With every purchase made at any of the Nature’s Fare locations, the Arts Centre will receive 3% of the pretax totals submitted. The public can save their receipts and submit them to the Arts Centre which will help the Arts Council of the North Okanagan with some extra funding. If you have any questions about the program, please contact Nancy Vince at navince@shaw.ca or 250-541-0028.